Our little guy works on his vault skills. When our boys were little, we did what all suburban parents did. We enrolled our kids in class after class, letting them try out countless activities to see what might be their thing. We tried swimming, soccer, baseball, tumbling, and multi-sport camps. Nothing clicked. I can’t tell you how many times our sons did not advance from a basic swim class. I can recall four different swim schools that could not teach them. We were beating our heads against a wall. I used to complain that if I could get the money back for every class they attempted and found no success in, I could fly to Europe and back. Twice. Yet, we persisted in our parental folly and perpetual money wasting because we felt they should be able to do these things other kids could do. Our expectations told us to hang on. If we threw enough money at it, sooner or later something would have to stick, right? When they were 4 and 6, they were diagnosed with sensory processing disorder, which affected their fine and gross motor skills. They had very low core strength, as well. This explained why swimming and tumbling were nearly impossible for them while other kids their age breezed through without any trouble, but it did not make us feel any better. With assistance from occupational therapy twice weekly, they both learned to ride bicycles after they turned 8. They still had difficulty throwing a ball. Catching one was nearly impossible. Over time and with continued therapy, their core strength improved. They made progress, but they were still years behind other kids their age physically. We accepted it for what it is, and we stopped enrolling them in activities that made them feel slow, incapable, and defeated. We figured there was no point pushing them when they physically and mentally were not ready to be successful. We made the choice to let them just be kids. Time would take care of the rest. Tonight, we made a big leap. We decided it was time to try again. 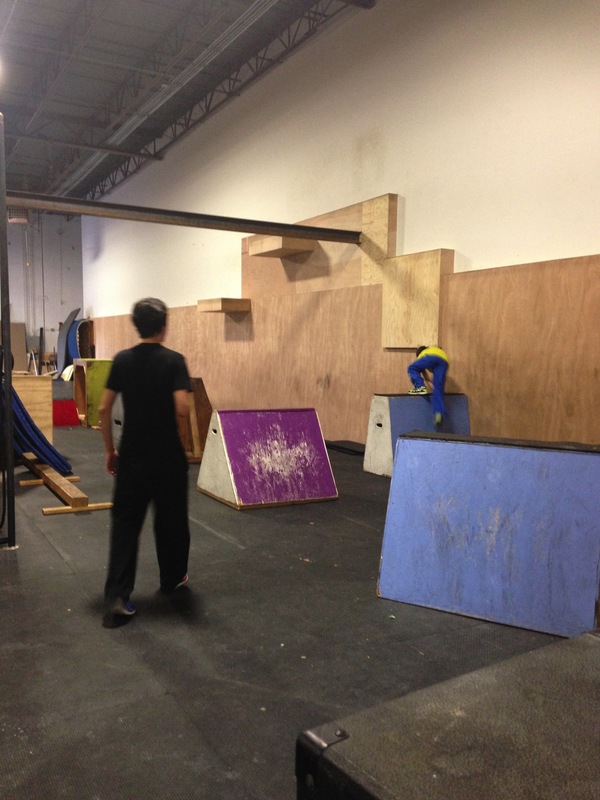 I drove them to Apex Movement, a parkour gym, and enrolled them in an introductory class. I’d heard about parkour years ago from a male occupational therapist who worked with the boys and thought it might be a great thing for them. At the time, I showed the boys videos of professional parkour to pique their interest. They thought it looked cool, but weren’t totally on board. I talked about it the last two summers, telling them I could register them for parkour camp. Still…no interest. I reminded them of their successful work on the climbing wall at school and told them they were ready to take this step. No go. Then, lo and behold, a couple of weeks ago both boys come to me and tell me they want to try it. I thought I’d finally gotten through to them. Nope. Turns out their friends are doing it. There you go. On the way to the gym, Joe was nervous. He began telling me that maybe he could start next month instead. I told him that you’re always nervous the first time you do something. It’s that nervousness that tells you that you’re actually growing. If you go through your whole life, never putting yourself in situations that make you uncomfortable, you never progress. I reminded him of some recent times when I had been nervous about something and how it worked out without incident. You can’t have success if you’re afraid to risk failure. I reminded him that his success rate so far in surviving uncomfortable, new experiences was 100%. All of the times he’s tried something new, he survived and was better for it. This would be no different. When we got to the gym, the boys could barely stand the waiting process while I filled out waivers and verified payment and class information. They were dying to get out and jump around. When they got the all clear, they went into the open gym time and started trying out every obstacle they saw. When class started, they listened and tried everything that was asked of them without concern about failure. As I sat watching them make honest attempts at new things, some successfully and some with definite room for growth, I was so proud of them for being willing to move forward and try again, for facing their nerves and taking a chance on themselves. I was a fearful child. I did not learn how to take risks. I instead learned that failure is not an option. I hid behind excuses so I didn’t have to try anything. I left important things unsaid and undone. I avoided opportunities to make mistakes or do goofy things until I was in my forties, when I finally realized that I was letting life slip by unlived. Most of the time, I feel I am an adequate parent, just good enough. I try. I make mistakes. I apologize. I try again. Tonight my boys showed me something. They’re braver than I was at their age, which means we are all making progress. We’re learning to give ourselves a chance. Seven years ago, my kids weren’t ready for the opportunities we gave them. And seven years ago, I made a conscious decision to begin work on my own risk-taking skills. Now here we all are together. The stars and planets have aligned. We are still nervous but trying because it’s better to try and fail and at least learn than never to know what might have been. Who knows with a little parkour and seven more years where we might end up?